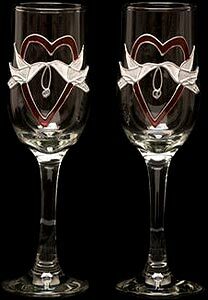 Our Doves & Hearts design available in champagne flutes and goblet makes a special symbolic gift for lovers celebrating anniversaries, civil partnerships, engagements, handfastings and weddings. The heart represents passion and the white doves bearing the betrothal rings of love symbolize peace and hope. This design is available in a choice of silver or gold liner.